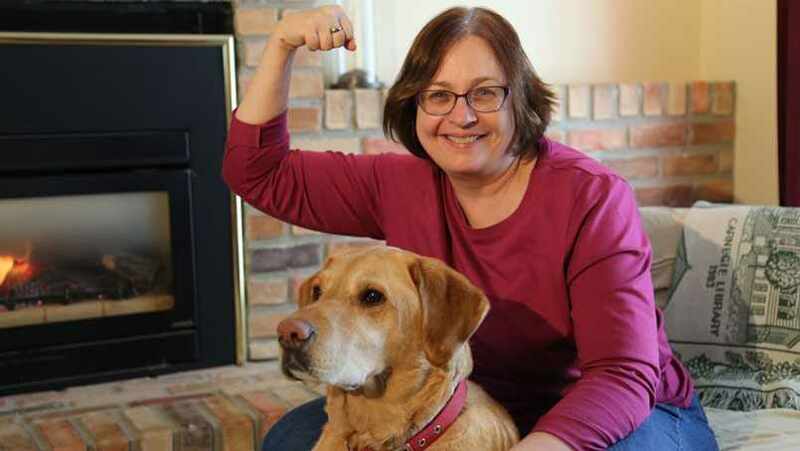 Twelve years after her diagnosis, Jane Jacobs knows the value of finding and treating colon cancer early and is participating in Fight Colorectal Cancer's #StrongArmSelfie campaign. Jane Jacobs understands the squeamishness some people have as they consider going through tests to check for colon cancer. "No one wants to think about or talk about their colon," she says. "You don't see it. Its job is hardly glamorous. It tends to be part of the body people would rather forget about." But after being diagnosed and successfully treated for early-stage colon cancer at age 40, Jane, who works in Media Support Services at Mayo Clinic, strongly encourages others to get past their hesitancy and get a colonoscopy. "The bottom line is that the colon cancer screening process is not as bad as people make it out to be," she says. "It's a fairly straightforward test that can make the difference between an early diagnosis, when the disease can often be more easily treated, and a severe, sometimes life-threatening, illness." Jane knows firsthand how serious colon cancer can be. Two of her close family members had colon cancer. Although she was aware of the disease and knew the difficult consequences, Jane didn't think too much about how that family history might have an impact on her own health — until she came to work at Mayo Clinic in the late 1990s. Her new primary care doctor noted her family background and recommended a colonoscopy. Jane didn't jump at the opportunity. "I was 38. My kids were little. I kept thinking, 'Oh yeah. I have to find time to do that,'" she says. "The time went by. I didn't get around to it. When I turned 40, my doctor insisted that I couldn't put it off anymore." That time, she followed his advice and is forever grateful that she did. The colonoscopy revealed stage 2 adenocarcinoma colon cancer. Surprised to get the diagnosis, Jane did take comfort in the outlook her care team at Mayo Clinic spelled out for her. She needed surgery, but she wouldn’t require radiation or chemotherapy. In April 2003, surgeons removed several centimeters of Jane's colon where the cancer was found. Since then, she has had regular follow-up exams to monitor for a recurrence, but no additional cancer has appeared. "I feel like I'm a poster child for early screening," she says. "They found the cancer and took it out. That's it. If I had waited longer to get that colonoscopy, it may have been a much different story." She gives credit to the persistence of her doctor and the experience of all those on her Mayo Clinic care team for recognizing that her situation required attention. "I don't know that I would have gone through with a colonoscopy when I was that young if my doctor wouldn't have impressed on me how important it was," Jane says. "I think that's a big part of the care at Mayo Clinic. There are a lot of really smart, really caring people here who have figured this stuff out. They have seen this time and time again. The collective wisdom they have from doing this hundreds or maybe thousands of times benefitted me. Every patient that comes through the door at Mayo Clinic is standing on the experience that their providers have gained from all the people that came before. And yet, I never felt like just a number in a big group. They had concern for me as the individual who was sitting in front of them." Reflecting on her cancer diagnosis and treatment more than a decade later, Jane doesn't define herself by what she went through at that time. She does, however, feel the experience has informed her outlook on life. Having cancer when she was 40 gave her a unique opportunity to gain some perspective on the way she wants to live. "In a way, I think that it was a luxury for me to be diagnosed early," she says. "I'm not looking back on my life regretting what I should have done now that I have the perspective that I do. I can move forward with this understanding and live in a way that puts value on the things that are truly important to me. When I look at it that way, I think of getting colon cancer when I was younger as a kind of gift." For others shying away from the prospect of colon cancer screening, Jane encourages them to take a different perspective, too. "I really think it's how you put your head in the game," she says. "If you put a priority on wellness and health, getting a colonoscopy when you need to fits right in. Think of it as a cleansing process and a chance to re-evaluate and reset your priorities." Mayo Clinic is the social media partner for the Fight Colorectal Cancer community's #StrongArmSelfie campaign. The idea is to raise awareness of colon cancer prevention and screening by encouraging people to take a “selfie” with their best “strong arm” pose and then post it online using the hashtag. During March, colorectal cancer awareness month, Sharing Mayo Clinic will feature several patients participating in the campaign and sharing their stories. Mayo Clinic also released a music video to accompany the #StrongArmSelfie campaign, and Jane is featured in the video.